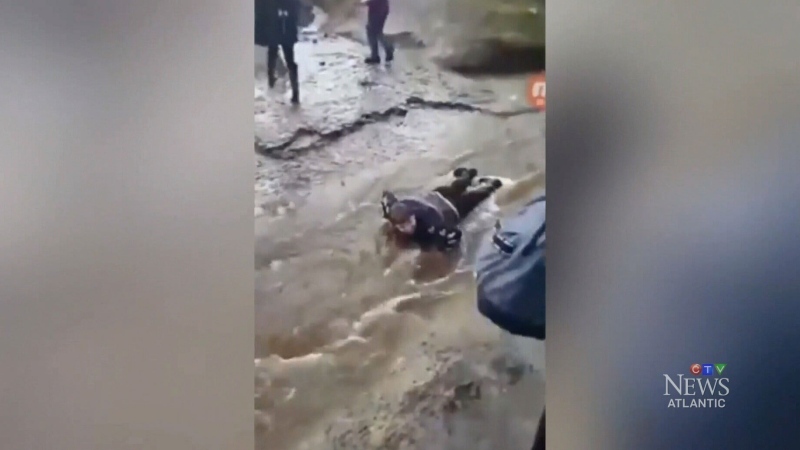 Video emerged earlier this week of 14-year-old Brett Corbett being told to lie down in a creek outside his Glace Bay, N.S. high school while other students stepped on his back to get across the water. Clips of the incident show students yelling profanities at the boy. The video has been viewed more than 185,000 times since Thursday. The father of one of the teens in the video, spoke on behalf of his son during a public meeting about the incident on Saturday. "This has turned out to be the worst decision of my life, but first I want to say I'm sorry to Brett and his family," the father read out loud from his son’s written statement as he fought back tears. Corbett, while not speaking to the media on Saturday, said he’s accepted the apology. As of Friday, some other students involved in the incident had yet to apologize, indicating Corbett was a willing participant in what they thought was a joke. The Cape Breton-Victoria Regional Centre for Education said Friday that they are taking the incident seriously. The family has said that they plan to take the matter to police if they are not satisfied by the school’s response. An anti-bullying rally is tentatively scheduled for Tuesday in Glace Bay.